How do I join for free? You have a couple options to join for free. 1. You can join our Work Hard, Play Hard Program where you will receive jewelry credit equivalent to your Grand Opening sales. You will need a Mentor to help at your Grand Opening, her role will be to set up a beautiful display and guide you on how to hold a successful Grand Opening. You will also have the option of designating if you want to receive 100% of your credit in jewelry or if you want to use some towards a business supply kit. 2. Or you can join our Work Hard, Play Hard Reimbursement Program. We understand that a Mentor may not be in your area to assist with your Grand Opening which is why we have created the reimbursement program. Under this program, you will first purchase the $198 kit and hold your own Grand Opening but once your orders of $500+ and 3+ order are submitted then you will be reimbursed the $198 you paid to get started. Can I lose my downline? Will you have training materials available? Of course! We will have an Academy with various training materials and tools you can use for yourself or to help you build your own Society. We will constantly work to bring you new materials, videos and social media tools to keep your business on the cutting edge of technology and fashion. You have options when it come to getting paid. If you have a Social booked for tonight and you need money you can retain your commission and submit the balance when you place the orders in your back office. Or you can submit your Social and wait to receive your weekly commissions. That is the beauty of Elegance Inc. you get to choose what “Success” looks like to you, you get to choose how much money you want to make, you get to choose how many hours you want to spend on your business. Our goal is to make Elegance Inc. flexible so you can create the business that fits into all areas of your life. What will you choose? Will Elegance Inc. expand past jewelry? Yes! We have so many things in the work and we wish we could reveal everything all at once but we promise you are going to love all of it! How much time do I need to spend on my new business? That is entirely up to you. You’re your own boss, and you will set your own hours. Just remember, you have to Show Up To Go Up! When will I start getting paid? Right away! You can make money the night of your first Social. 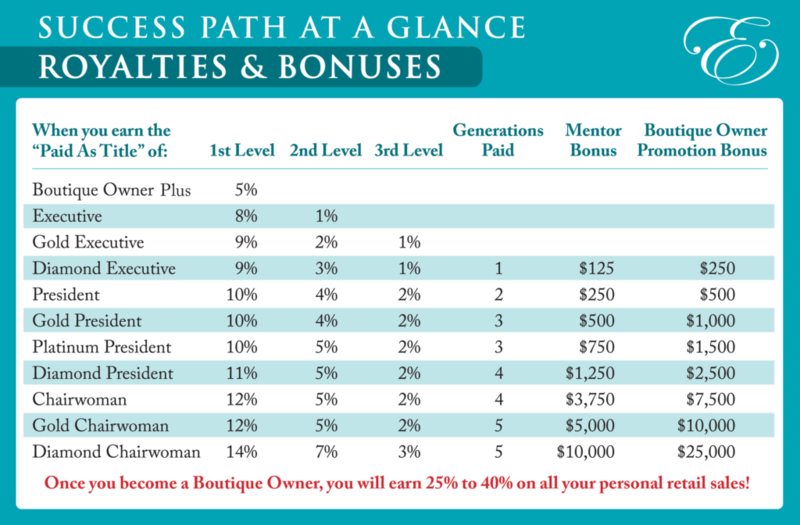 When you become a Boutique Owner, you’ll earn 25%-40% on all your retail sales. You can layer your income by building a team and teaching them to do the same thing you’re doing! Will there be someone to help me start my new business? Yes, you will have a mentor who will answer all of your questions and help you with all of your “firsts.” The Elegance Inc. Online Academy is another great resource with a growing collection of training materials and videos to help you succeed. Of course, you can always call the home office — we will always be here for you! Then Join our Limited Announcement List NOW! Get Empowered Through Elegance with Elegance Inc.